For more than five centuries, farmers, treasure hunters and others have applied a pseudoscientific practice known as “dowsing” to find water, caves, graves and more. 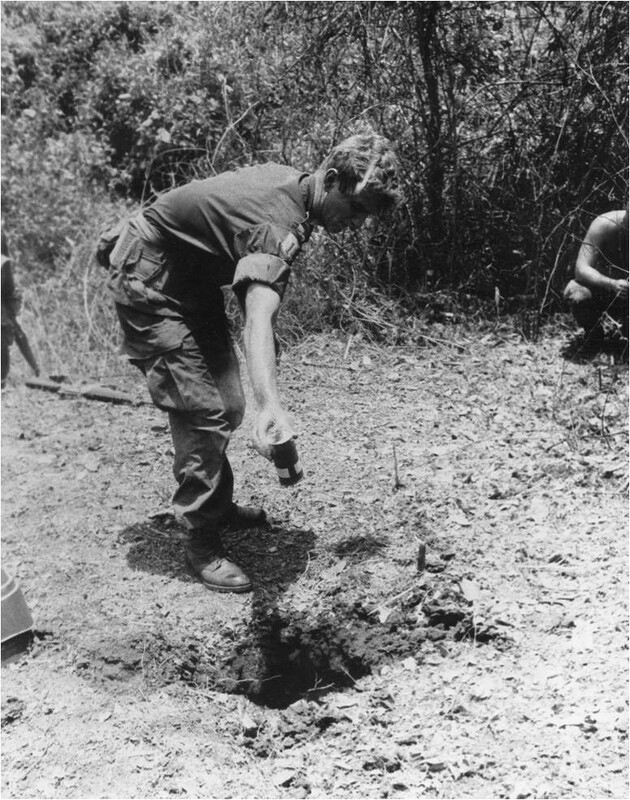 During the Vietnam War, American troops tried using the method to divine the location of Viet Cong tunnel networks. Continually frustrated by the underground networks, the Pentagon made locating and destroying the subterranean passages a main goal in 1967. A year later, defense contractor HRB Singer told the Office of Naval Research that dowsing might hold the answer. “Undoubtedly, any system that offers some promise of improving the odds above pure chance of discovering and locating the enemy is worth a try — if nothing else is available,” the scientists explained in a 1968 report. The U.S. Army and Navy had both so far failed to build a machine that could reliably detect the tunnels. In spite of repeated studies failing to prove any scientific basis for dowsing, the practice has endured to the present day. HRB Singer was optimistic that dowsing could help in South Vietnam. Debates have raged about whether dowsing works since the practice first evolved in Germany in the 15th century. In 1518, Christian theologian Martin Luther decried the practice as occultic — and an affront to God. A common understanding surrounding dowsing is that certain people can either innately sense small shifts in Earth’s magnetic fields that indicate open underground areas such as caverns. These individuals can train others to feel these changes. Others have linked the diving to psychic abilities or other factors. Dowsers may use a Y- or L-shaped wood or metal pole —typically called a “divining rod” or “witching rod” — to help in their search. However, some practitioners don’t use any special tools. Despite widespread skepticism, HRB Singer was quick point out dowsing’s clear military applications — if it worked. In South Vietnam, Communist rebels routinely ambushed American troops from camouflaged spider holes and bunkers linked to extensive underground networks. “The evidence suggests that this network of underground installations which has been under construction for more than 20 years is an even better base for communist guerrilla … than was Castro’s Sierra Maestra range in Cuba,” HRB Singer’s Richard Bossart wrote in the report. The Pentagon was trying pretty much anything it could think of to close these tunnels. In 1963, the Army tried using anti-tank rockets to blast into the underground pathways. Three years later, the ground combat branch started working on a handheld device that could accurately measure differences in magnetic fields to find the Viet Cong hideaways. Dogs were another option. In 1967, the Air Force looking into trying liquids that would change colors if surface temperature was markedly colder from that underground. This could indicate a large heat source such as a mass of people or a cooking fire. None of these projects were working out. Between 1966 and 1971, the Army spent more than $500,000 on the portable magnetometer — nearly $3 million in 2016 dollars — and only got a dozen prototype devices to South Vietnam for tests. With few options, American troops had already turned to dowsing in the field before HRB Singer started their research. Around the same time HRB Singer started their research, the U.S. Marine Corps went so far as to “train” a small group to dowse for tunnels. The Marine Corps Development and Educational Command put the leathernecks through a four-hour course in the practice. In March 1968, Associated Press reporters spotted the troops near their base at Khe Sanh using bent brass rods to find their subterranean foes. Bossart and his colleagues hadn’t been able to to figure out if the Marines’ had any luck with their witching rods. But it wasn’t enough to dissuade him from moving forward with his own investigations. After reviewing the available literature, the HRB Singer team — including a number of employees who were amateur spelunkers — kicked off its own experiment. Having already used dowsing in their hobby, these individuals were happy to explore the phenomenon. The company’s experts worked together with locals and students in and around Pennsylvania State University. The test subjects found a underground cavern in one case and a septic tank in another. Still, Bossart felt the results showed the potential of dowsing and the need for more and better studies. The key was trying to conclusively prove whether the practice was a science, an art or pure luck. In the end, neither HRB Singer nor the Marine Corps could prove a scientific underpinning for dowsing. In 1971, with the Vietnam War steadily winding down, the Marines canned their program. With its continued popularity in certain regions of the United States, the practice continues to pop up in military circles. In 1988, Air Force lieutenant colonel Dolan McKelvy made the case for dowsing among other types of “psychic warfare” as part of an Air War College research project. In 1990, Lewis Carl, a “professional dowser,” tried again to get the Army interested in dowsing. Carl claimed the practice could help solve water problems for American troops rushing to the Persian Gulf following Saddam Hussein’s invasion of Kuwait. Four years later, David Gaisford conducted his own experiments into the procedure as a student at the Air Force Institute of Technology. In reviewing the historical record, he noted that the Marines had concluded there was no “scientific basis” for the practice. The ground combat branch wasn’t interested in Carl’s offer. And just like those before him, Gaisford couldn’t find any solid evidence and called for more research. Today, civilian scientists and engineers and their military counterparts generally rely on advanced magnetometers, radars and lasers to see enemy tunnels and other threats beneath the surface. So far, no one has been able to convince the Pentagon to add witching rods to soldiers’ packs.